Watch the impressive video of the wing bending test, performed the week before the First Flight . This "torture testing" was required for First Flight Clearance. Test campaign continues towards ultimate load level of 1.5LL on route to the Type Certification. This is more than the aircraft will ever experience and ensures that it has more enough margin for strength. 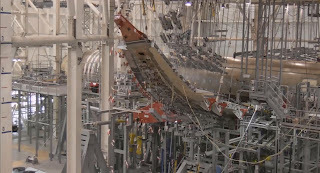 Using jacks and loading lines to push and pull (mostly pull), the wing bending test gets a difference of more than 5 meters between rest position and the maximum bending point of the wingtip. After the Type Certification Clearance, by the end of 2014 or in 2015, it is planned that the team will stress the wing until they break to help Airbus gain experience for future aircraft design.